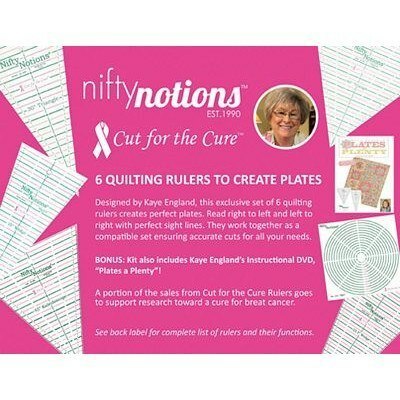 The Plates Ruler Collection 6 Ruler Set includes: 15 degree ruler, 22.5 degree ruler, 30 degree triangle ruler, kaleidoscope ruler, 60 degree triangle ruler, circle template ruler, and a Plates a Plenty DVD. Designed by Kaye England, this series of rulers will work together as a compatible set. These rulers read right to left and left to right and have perfect sight lines. But perhaps most important of all, a portion of the proceeds from each ruler goes to The Chicagoland Affiliate of the Susan G. Komen Breast Cancer Foundation.